This wall turned out so well! The choice of the stain color is perfection! Very nicely done! And those lamps are THE DEAL, to be sure!!! Superb job, gentlemen…superb!!! Thank you for sharing! Thanks Sally, It’s even more beautiful in person….In fact, I’m gazing lovingly at it as I type this…..
Gorgeous-and thanks for the tip on wetting the wood before staining it (with oil based stain). I have never heard that before, but your finished project proves the point. Glad that you like it Janie…..I don’t stain very often, so I’m always looking for ways to make it easier…and prettier. Visiting from Burlap and Denim and am so thankful she hooked up with you to share this. What a beautiful room. I agree that a glue gun is a must have in our arsenal of tools. Looking forward to exploring the rest of your site. Thanks for sharing! Wow! That’s gorgeous! Love the lights! Thanks for the heads up on this stain color! I just tried it on some solid wood ikea furniture. AMAZING! Can’t wait to see what you guys are up to next! We’re Amazed that you could find solid wood furniture at Ikea..(hehe) Yepp, it is a great color….and per usual, the last one I would have thought of using…..
OH yeah! The Tarva series is solid untreated wood. Not to mention super cheap. I was surprised at how long it actually took to build compared to it’s particle board brethren. And solid too! The chest of drawers I used. Hi James, great site! Wondering if you might share where your bedframe is from. Thank you! Hi Tiare, this is just slightly embarrassing, but we got it from Rooms to Go, I think it was 300$. It’s their Pottery Barn style. We want to replace it with something made of wood……but haven’t found anything that we like better yet . 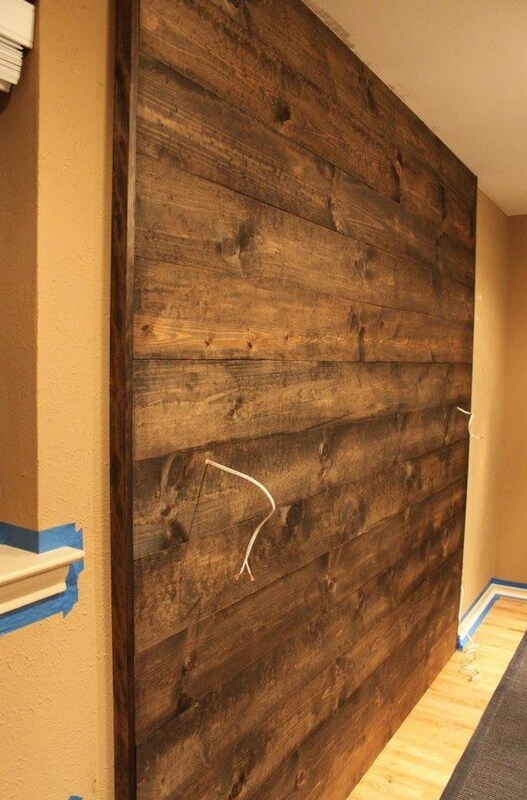 Saw this on Pinterest, what an awesome accent wall. I’m particularly in love with the lamps, where did you get them? Thanks for sharing! Hi Melanie, our wall looks even better in person, we admire it every day. We got the lamps at Restoration Hardware just about a year ago. They were having a lighting sale and they were about 100$ each . Now go build a wall! So glad that we could inspire you. We are so happy with it, that it’s hard to not build one in every room. But that might be overkill. 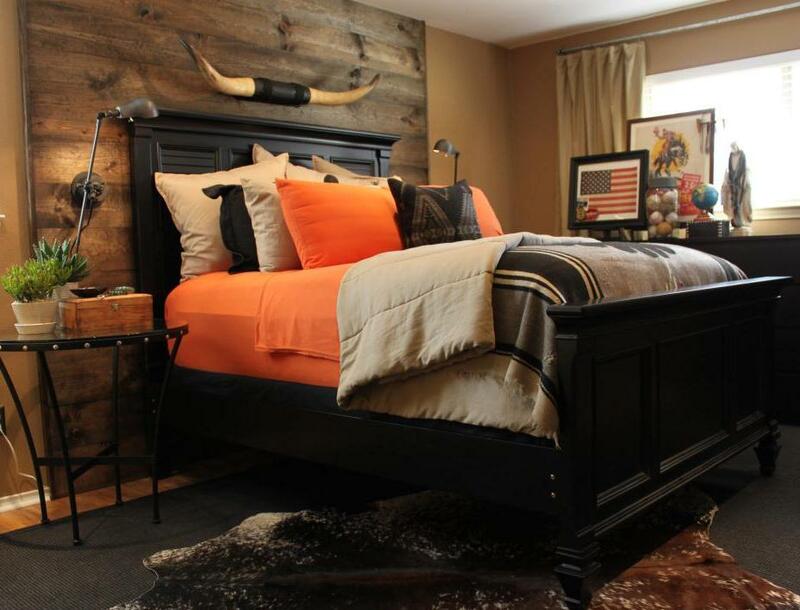 very nicely done, so rustic and were i come from would love my bedroom like that, only problem is i am disabled and have no one to make a bedroom like that. being from the west i truely do miss home and this would bring me home and make me rest at nght instead of the stupid wall color they have on the walls when i bought the house, ahhh to have a nice bedroom like that. very gorgious and thanks for taking me back home a little bit. again i sure wish i had someone to do that to my room for sure. Hi Debby, we’re so glad that you are reading along with us …I think our bedroom would fit right in in Wyoming…. 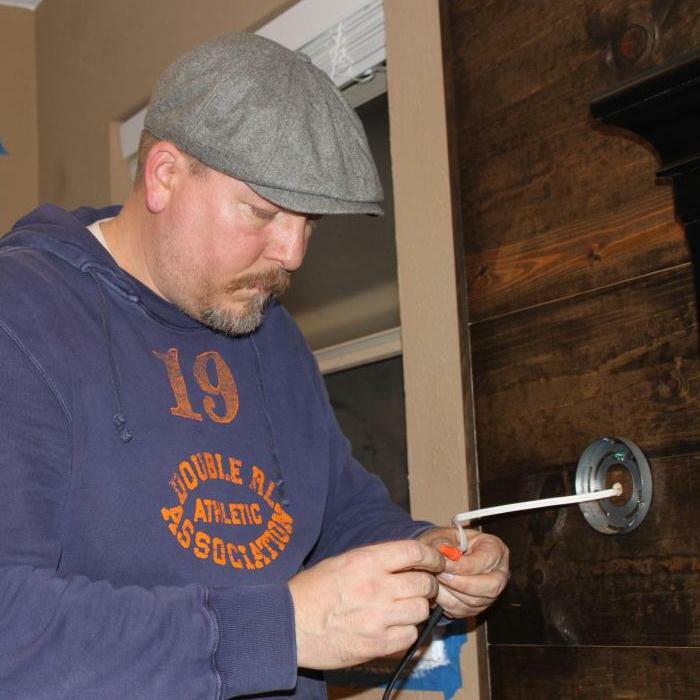 Pingback: James’ Rustic Yet Refined House TourDo What You Love, Love What You Do! I love, love, love your bedroom! You guys have a fabulous home and great talent. Where did you find the red Navajo blanket and rug? I think they are fabby! Love your room! You guys are very talented and creative. 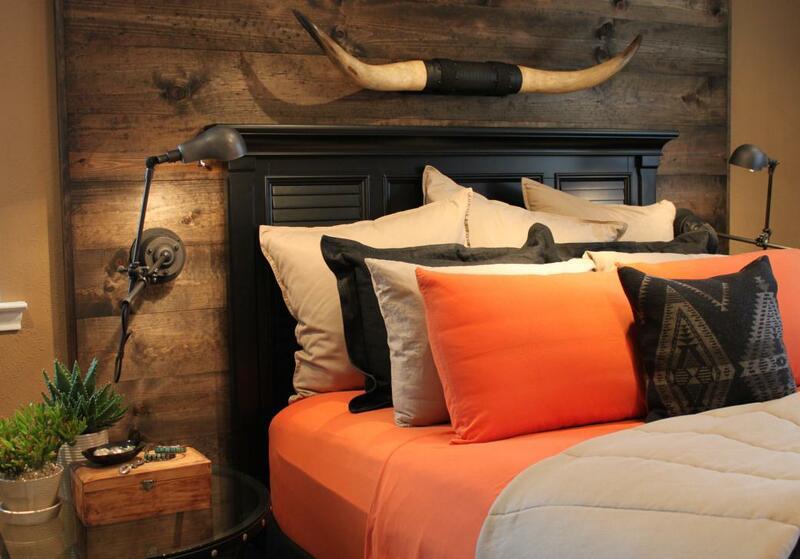 Where did you get the horns above your bed and your bedding? Thanks! Hi Dani, The horns were a gift from a friend years ago, but I still see tons of them on eBay. The red blanket is a very old Pendleton, not made any more, but there are many, many more on their website. That’s great Becky! Glad that we made it look easy for you…… We’d love to see a finished pic when you’re done! I just found your blog site tonight while looking through some pinterest home repair ideas. I only looked tonight at this project and the fence. I will return later in the week and look at more of what you have done. The wood wall in the bedroom looked well done. I, too, had never heard the tip about wiping down the wood first before you stain. I will keep that one in mind. I use pallets/skids for many projects. I have found three sources for them where they are brand new and the companies I get them from do not reuse them. The lumber from them looks brand new save for the holes from the nails. The companies thanked me for asking for permission for them and when they get some special pallets/skids in they will call me to let me know they are setting them out. I look forward to following your future posts. God bless. Beautiful wall .. going to do it for my sons room next week. Did you buy smooth or rough sawn planks? Just standard pine 1×8? Hi Tommy, just smooth standard pine planks off the shelf, didn’t even cut them……..very easy! What size nail did you use on the 1×8 plank?? 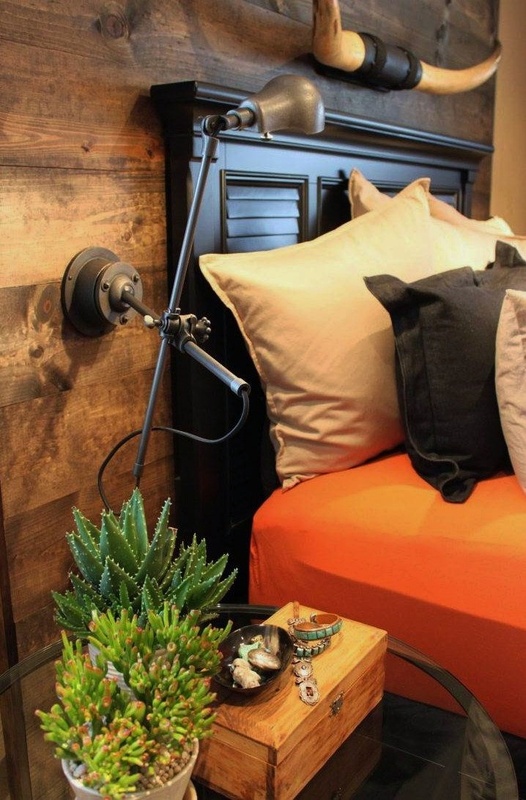 Going to do this to my boyfriend’s bedroom this weekend! Where oh where did you find those fantastic sheets??? Hi Cindy, Those juicy, juicy orange jersey sheets were from Target a few years ago. Aren’t they just the best ORANGE color? Like a friggin’ Crayola Crayon. I’ve been tryign to find replacements lately and have had no luck……Please let me know if you find some similar. What color did you use on the rest of the walls. Got it thanks so much!!! 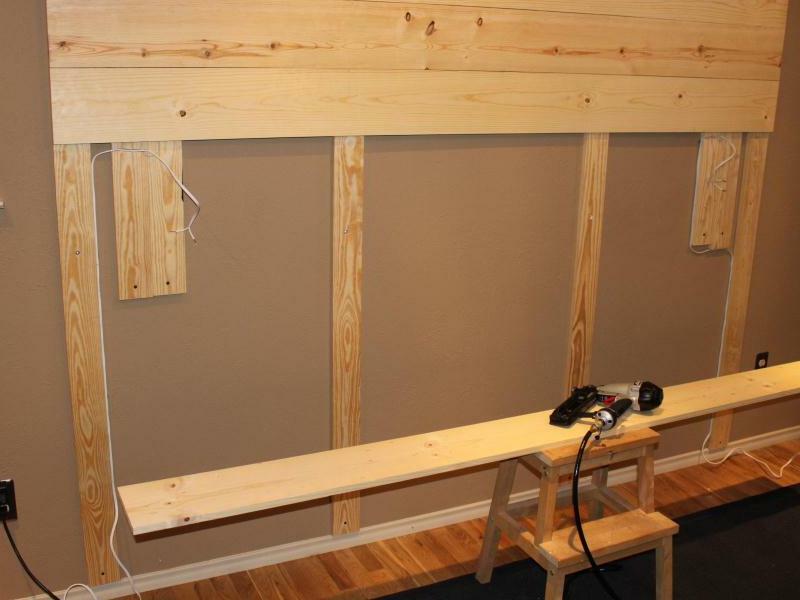 1- You mentioned nailing the board so very few nails were on the face side, can you please explain how you “…only shot nails in the bottoms and sides” – did you use the nail gun on an angle? Did that warp the boards at all or ruin in the integrity of the nail? 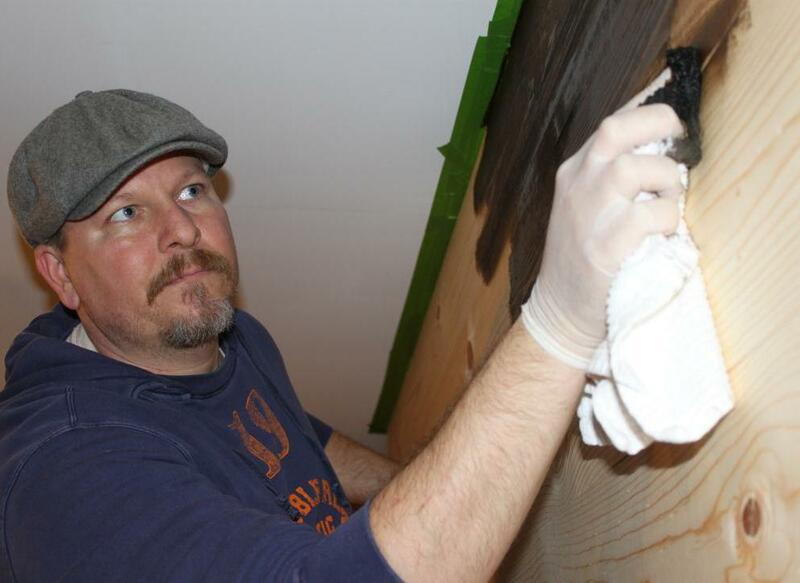 2- Do you recommend staining after the installation? thanks again for your help, hopefully we can share our master bedroom reno photo. How exciting that you are copying one of our favorite projects… I tried to use a few nails as possible, so yes, I shot them at an angle into the sides of the boards. I did shoot a few into knots…so they wouldn’t be that visable. It might be a good idea to stain your wood before assembly, just in case they do shrink a little you won’t have unstained areas showing between boards. It’s been up 3 years now, and no warping at all for ours. Just plain pine/white wood from Home Depot. We don’t have much humidity in Dallas….so that may help prevent warping too. can’t say enough about the whole BR ensemble. it’s awesome! where did you get your bed linens: sheets, red/blue “W” pillow shams, accent pillow, etc.? Thanks TJ. This is a pretty old picture and most of my sheets were old then. The black/white striped sheets, khaki comforter, and red/black pillow cases are all Ralph Lauren……long discontinued. The red/black blanket is Pendleton…..long discontinued too. The black and grey pillow I made with Ralph Lauren scraps from a client project….. That fabric is still available, but only by the yard. Try eBay , they have old sheets occasionally. i’m about to start building a wall like yours – got the 1900s pharmacy sconces also! 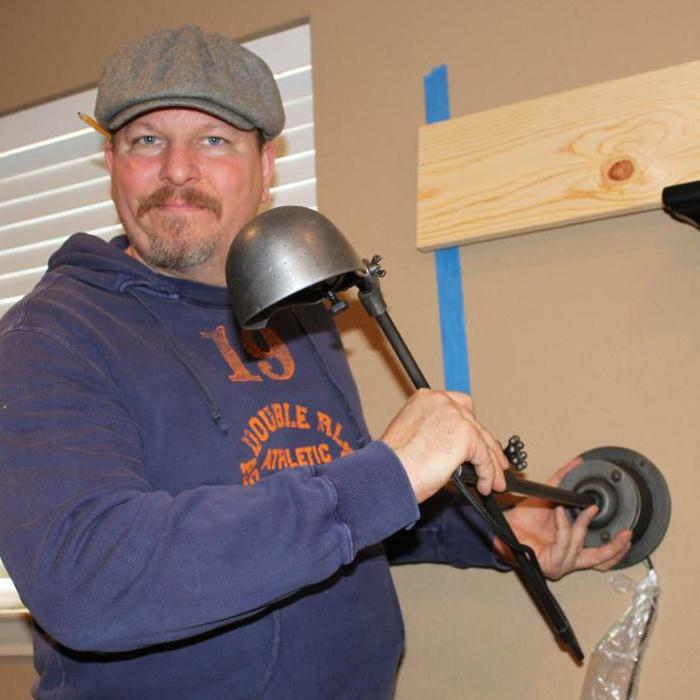 how high did you mount the sconces? and are you fine with that or do you wish they were higher or lower? Hi TJ, I think we mounted them about 4 feet up the wall. But our bed is pretty freaking high. It’s the perfect height for me to reach the switch in the morning. Remember that we mounted them upside down,(they look better that way) and the light part of the lamp is heavy……..it has fallen once or twice in the past 3 years. Doesn’t bother me…..just be warned. Those are extremely old Ralph Lauren cases…..mid90’s I think…..I got them on EBay a few years ago….. This looks fantastic. It has inspired us to get going on our own project. How many applications did you do? And, did you wipe it down or just let it dry on its own? Hi Pete, pretty simple, just wiped it on once and let it dry. This was a few years ago and it still looks great. Thank you for responding. And thank you for the inspiration. Thanks to you, we are now underway with our own project. Once again, your work is beautiful. Hi Jeff, sunken into the Wall isn’t such a bad thing. 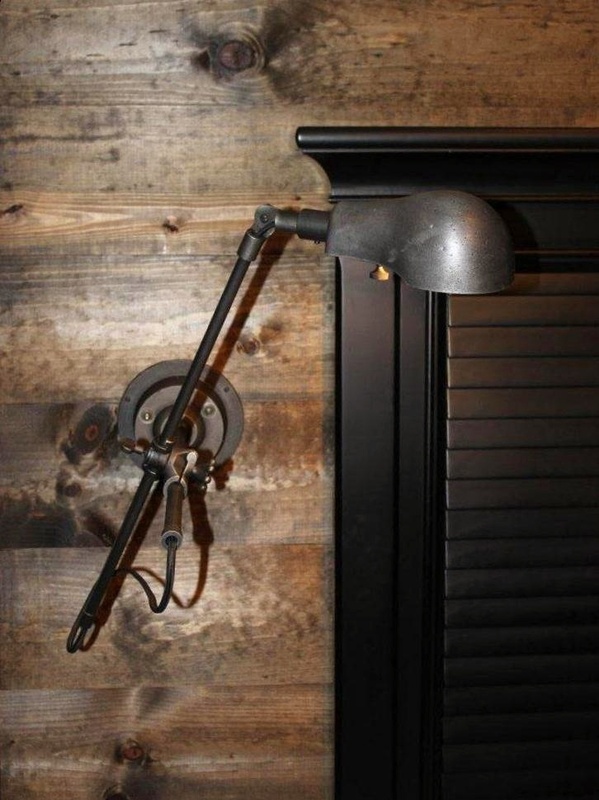 But if that bugs you, and yeah…it would bug me, just move the outlets forward onto your wood walls. 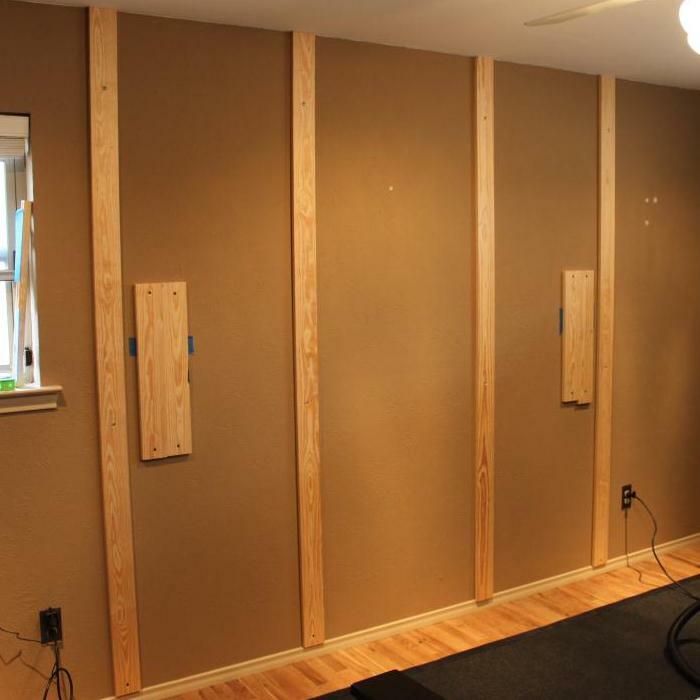 Remove the plates, unscrew them from the box, cut holes the same size as the one in the drywall, and reattach them on top of your new wood. You shouldn’t have to detach them from the electrical. Does that make sense?